Dave's Part: Brown against Blair: why? Now, I was a member in the early 1980s, and recall the pitched battles between the Bennite/Trotskyist left - to which I was aligned in the period - and the old school right wing in an East End district Labour Party. Certainly the atmosphere in many meetings was one most people would have found intimidating, although when you are a young bloke in your early twenties, you are sufficiently thick-skinned to take a bit of that. I never actually saw any physical violence myself. I do recall once squaring up to a 'comrade' - ha bloody ha - for voting the wrong way, although the matter didn't come to blows. But rumours of thuggery on the part of both right and left, especially on Merseyside, were commonplace. Although I quit the Labour Party in 1995, I find it hard to believe that things could possibly have reached the same pitch. Because at bottom, there is no real ideological cleavage between Blair and Brown. The newspaper pundits pen endless frankly tedious columns pointing to this or that nuance, to differences of emphasis, to subtly distinct packaging. But the policies of both men boil down to neoliberalism at home and neoconservatism abroad. Politics is not involved. 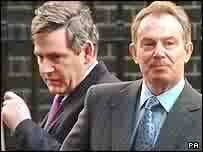 Until somebody comes up with a better explanation, we can only believe that the Blair/Brown spat is little more than a two-way hissy fit over who get the top job, and thus gets to pick plum positions for his mates. Can constituency activists - of which Labour has precious few left - really get worked up enough to feel passionately either way? If any current Labour Party members are reading this, please enlighten the rest of us in the comments box.